Battle Bugs Attack. Games online. 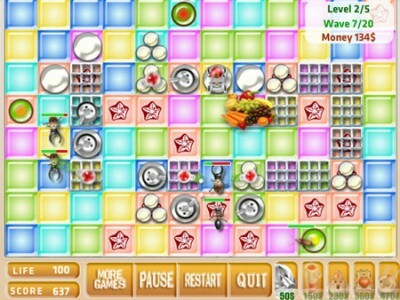 Your task in this game is to protect the food from the attacking insects. You can buy five different weapons. Put them in the special holders and protect the vegetables. You have to pass 5 levels with 20 waves of invasion each. Good luck in the battle!